Vintage Pawn Zuni Sterling & Turquoise Petit Point Necklace. 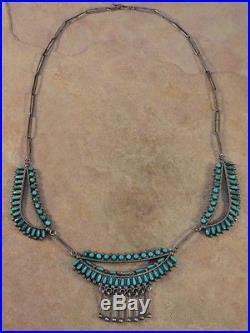 This is a beautiful, vintage, pawn Zuni sterling & turquoise petit point necklace. The necklace is marked NVH, Zuni, NM. This delicate piece measures 18 inches in length, end-to-end. The 2 side panels measure approx. 3/4 of an inch wide. The center panel measures approx. 1/4 inches in length including the 8 sterling silver dangles. It weighs 18.4 grams. This necklace is in beautiful vintage condition except one stone in one of the side panels has a very small chip. This could have happened when the artist was setting the stones. The item "Vintage Pawn Zuni Sterling & Turquoise Petit Point Necklace" is in sale since Thursday, February 23, 2017. This item is in the category "Jewelry & Watches\Ethnic, Regional & Tribal\Native American\Necklaces & Pendants". The seller is "explodingllama" and is located in Novato, California.